Vegas Strip Blackjack Gold - Play Online - Casino Answers! Vegas Strip Blackjack Gold is an online casino game offered by serial online game maker Microgaming, perhaps the biggest name in online casino business. Vegas Gold uses four decks of 52 cards each that are shuffled after every round of play. The object of the game is to achieve a total of 21 or less that is higher than the dealer’s sum, or by maintaining a total less than 21 while the dealer exceeds 21 (busts). If the dealer has an ace and a 10-value card, he checks his hole card. When the dealer shows an ace, the player has an opportunity to take an insurance bet for half the original bet. The insurance pays out at odds of 2 to 1 and remains independent of the main bet. You are allowed to split three times per bet potentially resulting in our hands. You can split any two cards with the same value an unlimited number of times, with the exception of aces which can only be split once. It is important to remember that split aces that are then hit with a 10-value card are not considered blackjacks. Even after splitting, you are allowed to double down your bet an unlimited number of times. This is one of the major differentiating factors of Vegas Strip Blackjack Gold from the conventional game. The dealer stands on all 17s throughout and checks for a blackjack on aces and all 10 cards. A blackjack comes with a 3:2 payoff. The payout only occurs on the original pair of cards. Any 21-total combination after that including on splits does not qualify as a blackjack. The presentation of Vegas Strip Blackjack Gold lives up to its tag, with its detail-packed interface. Microgaming has worked a life-like experience into the game through colorful graphics, realistic animations, player options, and music and sound. The game is a big improvement in many regards, from previous iterations with the aim of bringing the player closer to the authentic casino experience. In the traditional format of the game, one had to choose a bet using the “add” or “subtract” tabs. The Gold version allows the player to choose the coin size manually and place it on the table. On the bottom left corner of the screen you can choose from brightly colored chips until you find the one you like, then click on the table to set it down. The brightly colored table and chips have been replaced with a light green hue with wood effect and leather covering with more realistic rendering. The chips are also crispier and more detailed to contribute further to the authentic look of Vegas Strip Blackjack Gold. For more seasoned players, the “expert mode” is worth checking out. Here, you get a modifiable strategy table where you can try out and develop a few strategies. The AutoPlay feature enables you to put proven strategies to use even when you are not around. For absolute beginners, Microgaming have thrown in an easily accessible rules guide. The button are straightforward amd easy to understand, making the learning curve smoother for beginners. 1 Bovada Casino Must trustworthy casino for Americans. Bet Sports too! 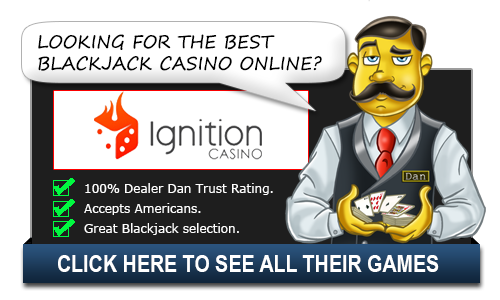 3 Ignition Casino Blackjack games like Single Deck, Zappit, Perfect Pairs.